Exalon Promotion offers you a wide variety of Organisers to choose from. Having these diaries and Business Organisers is like having your own Personal Secretary! 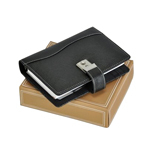 These beautifully stylish leatherite diaries are available in various colours . You can also personalise these diaries for each of your employees with their Names or Initials on it. We also offer diaries with watches on their covers & lock straps which not only adds utility but also uniqueness to your gift. Despite of the electronic revolution, Diaries have not lost their value and are well received by your corporate clients. It will never crash or loose your data and it's battery will never run down because it does not have one! Moreover diaries promote visibility of your brand not only once but the whole year. Diaries are Excellent New Year gifts as they will help you clients organise their data. Calendars are cliché make a difference with a different New Year gift. Your personal Organizer is just a click away! Great promotional discounts for bulk orders.